you can also use the coleslaw cabbage packet available in the grocery store. 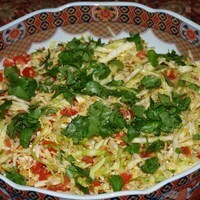 Place the cabbage, tomato, peanut powder, coconut, salt, sugar, and lemon juice in a large bowl. Mix well and set aside. Fry the mustard seeds in oil in a small pan over moderate heat until they crackle. Add the cumin seeds, turmeric, asafetida, and green chili. Fry until the cumin seeds turn a darker shade. Remove from the heat. Add these above prepared spices to the cabbage. Toss the salad thoroughly and make sure that the spices have been properly mixed in. Garnish with the coriander leaves. Chill and serve cold. The longer you keep this salad, the better it tastes. Make this at least 1 hour ahead and chill in the refrigerator. This develops the taste. This is a delicious Indian salad. It bursts with flavor but is not overpowering. Nancy made it for me on my birthday and it was a real treat! This was really excellent. I'll be taking this next time I am asked to bring a salad or side dish. It would go great with grilled meat. This salad is light and very refreshing, hints of spices (cumin, mustard seeds, and tumeric) balanced with tomatoes and lemon juice. A great salad dish to take to party! This salad looks and sounds absolutely delicious. I've even learnt a few things on the different ingredients you've chosen. i like veggie recipes and i am running out of it! thank you for sharing this. Looks interesting, must try it soon. this looks great, can't wait to try it at my house! This really sounds fantastic! I'll be trying it within the next couple of weeks and try to post a photo and a review. Thanks for sharing!